A 91-year-old who was fleeced out of £84,000 by a Warwick carer will get less than £4,000 back after the thief splashed the cash on a new conservatory and kitchen. Suzette Smith, 66 of Sharpe Close - who posed as her victim’s adoptive daughter - was finally caught scamming the pensioner after building society staff became suspicious of the large sums of money being withdrawn. Smith was jailed for two years and five months in May after pleading guilty at Warwick Crown Court to charges of theft and fraud. A hearing under the Proceeds of Crime Act found that despite having a new kitchen and conservatory from the money she stole, Smith was said to have ‘realisable assets’ of less than £4,000. Prosecutor Peter Cooper said it was agreed that Smith’s benefit from her crimes was £84,000 - but that her realisable assets came to a total of just £3,555. Recorder, Gareth Evans QC ordered that £3,555 should be confiscated from Smith under the Proceeds of Crime Act and, at Mr Cooper’s request, used to pay some compensation to her victim. Asking for Smith to be given time to pay, her barrister Aadhithya Anbahan explained that her husband Roger Smith will have to sell assets valued at £700 towards meeting the figure. Smith has until November 9 to pay, and will face a further two months in jail if this date is not met. The original hearing heard that the 91-year-old victim, who suffers from dementia, had daily visits to her Warwick home by carers including Smith, who she later took on a private carer. From then on Smith repeatedly took the old lady to her bank and building society ATMs to withdraw large amounts of cash, enabling her to steal £80,000 and fraudulently transfer £4,000 from the old lady’s account to pay for a holiday. 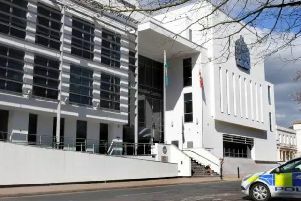 Her crimes came to light in January last year after Coventry Building Society staff became concerned when the elderly customer, accompanied by Smith, was withdrawing a lot of money and seemed confused. Previously small withdrawals rose to a total of 54 in 2013 totalling £27,200. This rose again in 2014 to 106 withdrawals, mostly of £500 at a time, totalling £55,000. When Smith was arrested officers saw evidence of a luxury lifestyle, including a new kitchen and conservatory, and found £2,000 in cash stashed in a shoe box in her bedroom. Eventually Smith, whose thefts continued after she had been given a community order for a benefit fraud in 2013, said she would ‘play a game’ on the old lady by pretending to be her adopted daughter, and agreed she had had several thousand pounds.